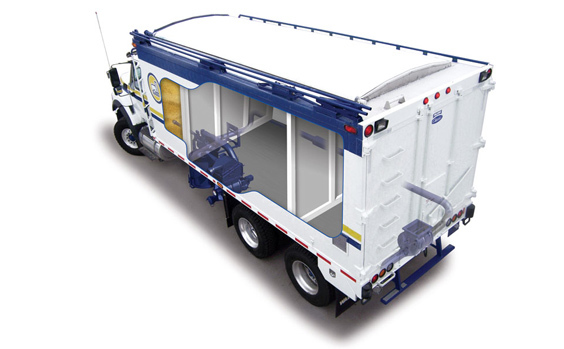 The main features of these units are: all aluminum construction, extruded side stakes, extruded crossmembers and longsills, 100 percent welded construction, moveable load dividers, various roof configurations and pneumatic or auger discharge systems. 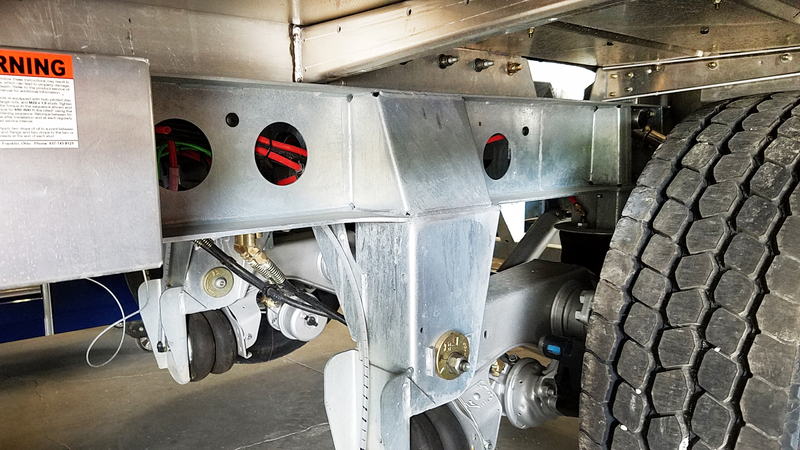 In addition to the above mentioned features Walinga Inc. also provides Weight Distribution Studies to help you decide what the best layout / design will be in order to maximize payload. Again, our commitment is to an ongoing program of research and development. 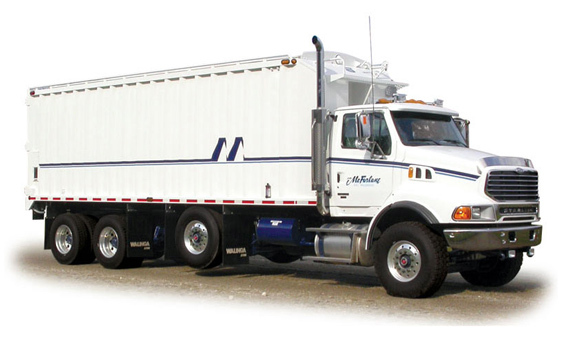 The Walinga Bag Bulk units are available in lengths from 12 - 28 feet in overall length. 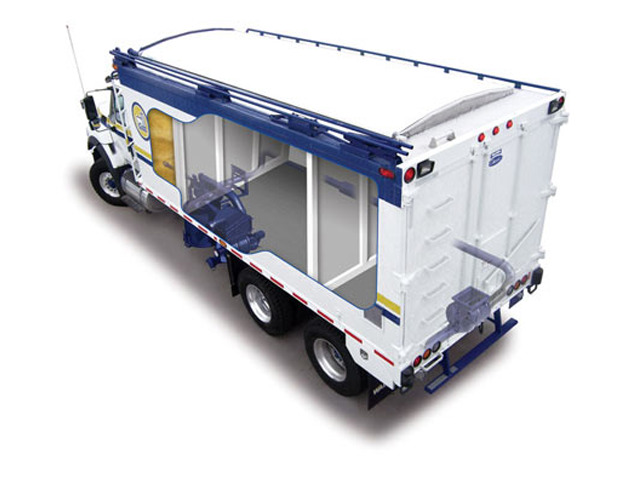 Extremely durable and light weight aluminum construction. 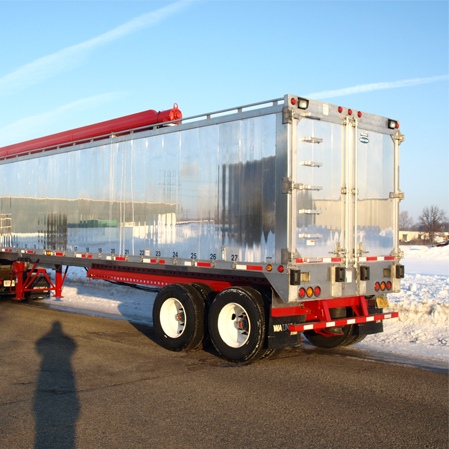 The only Trailer available with 100% Extruded Base. 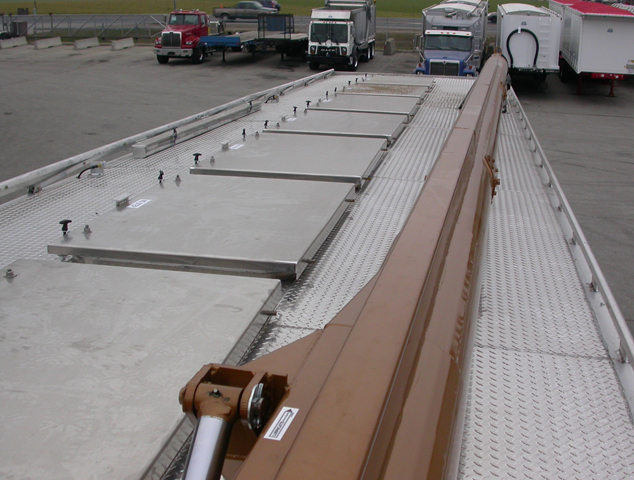 Extruded Base allows engineering to incorporate strength where strength is needed. This is something formed bases can not give you. 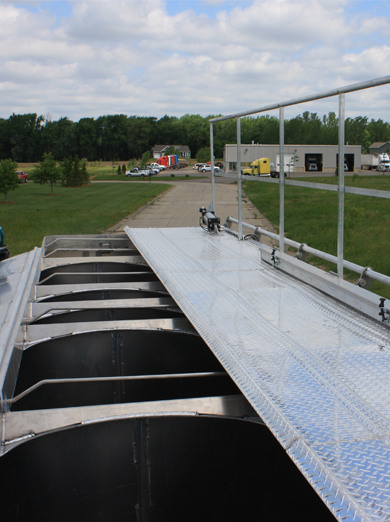 Aluminum Expanded Metal walkways offer easy access to entire top side of the trailer. 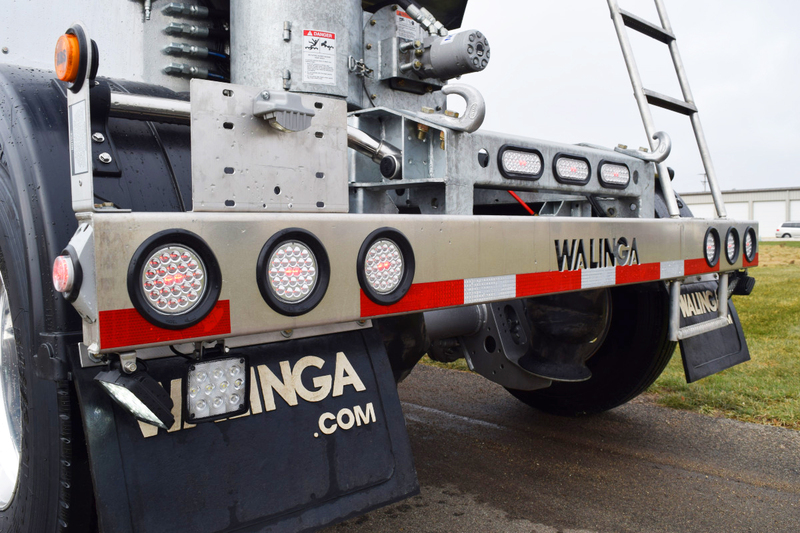 Walinga trailers feature V-20 hydraulic controls that are easily accessible as well as easy to understand and operate, using hydraulic fittings that promote good fluid flow efficiencies. 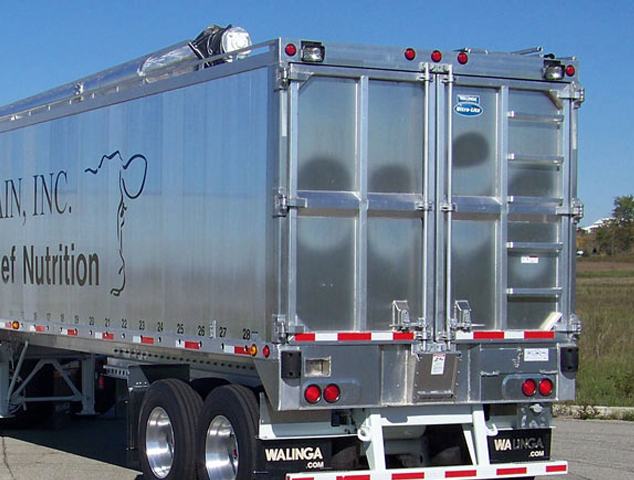 Walinga is the only manufacturer who makes maximum use of extrusions. 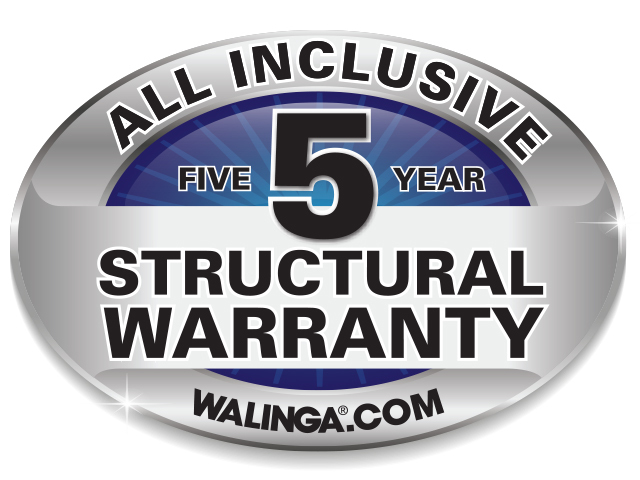 The complete Base of the Standard Walinga Ultra-Lite is 100% Extruded! 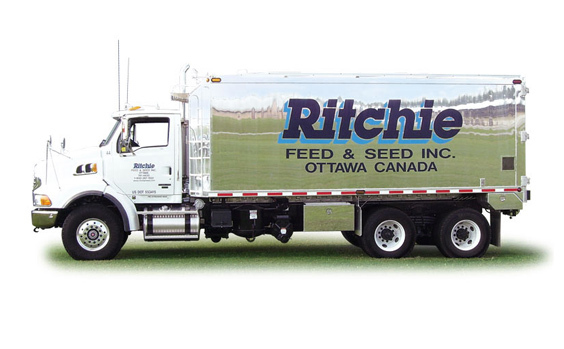 Right Feed.. 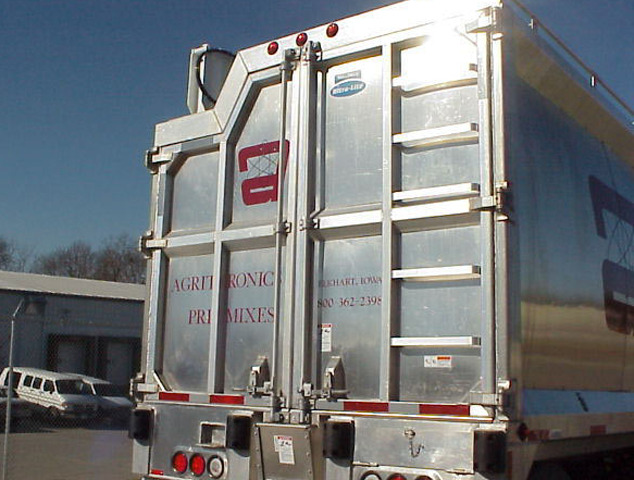 Right Bin.... Every time.... FEEDLOK RFID tags give you the security of knowing the right feed gets delivered to the right bin. 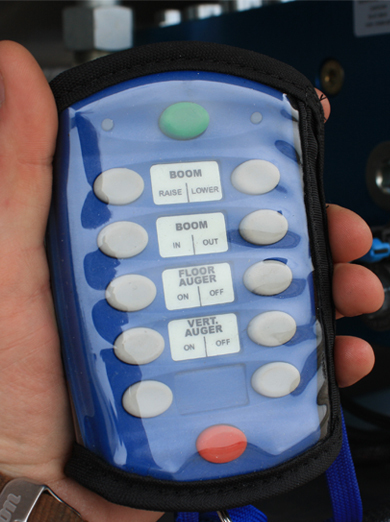 This controller, known as SmartTrac by MeritorWabco, monitors the vehicle’s rollover threshold and activates to slow the vehicle when the threshold is exceeded. After the conditions cease, normal vehicle operation resumes. 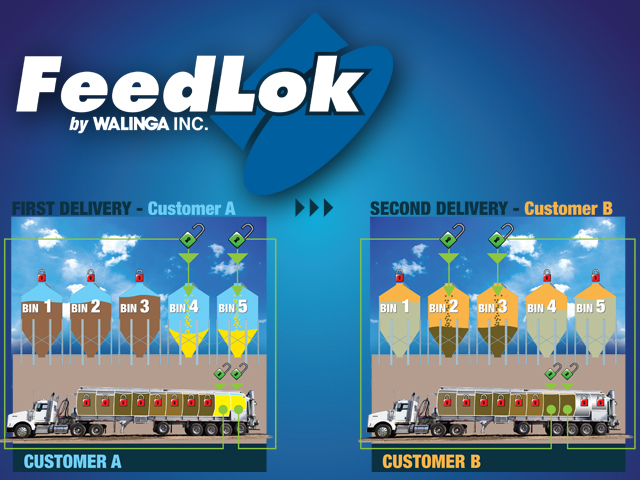 Walinga Inc offers a number of different options when it comes to unloading feed and grain. 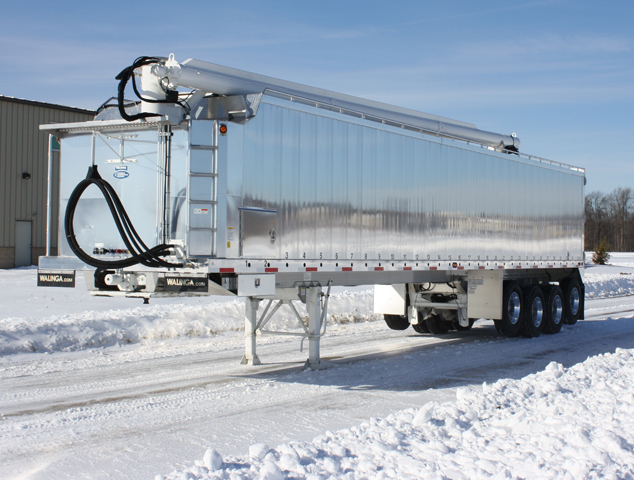 We offer auger unloading, air unloading, paddle chains and drag chains. Which ever suits your needs! 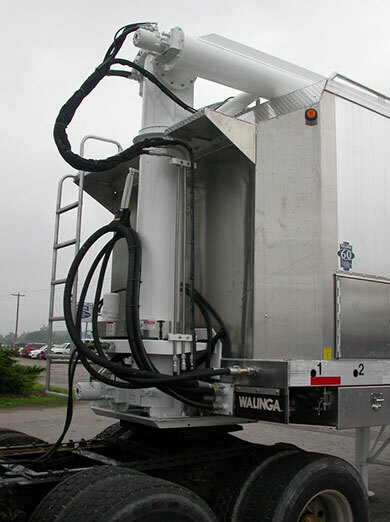 The Walinga Pneumatic discharge system utilizes the Walinga designed and developed Super Duty Positive Displacement Blower, as well as the Walinga designed and developed Cast Iron Airlock. 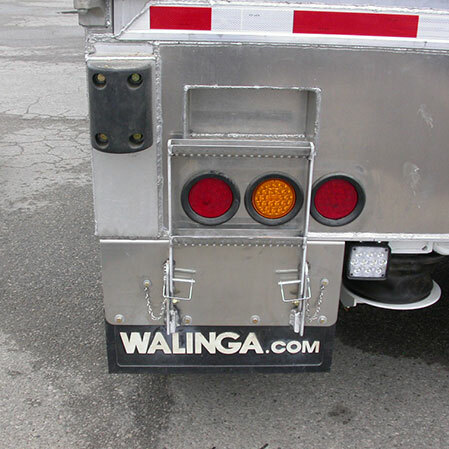 The Walinga design employs a 9in. (23cm) diameter trough auger with helicoid flighting on a 2 1/2 in (63mm) diameter shaft. 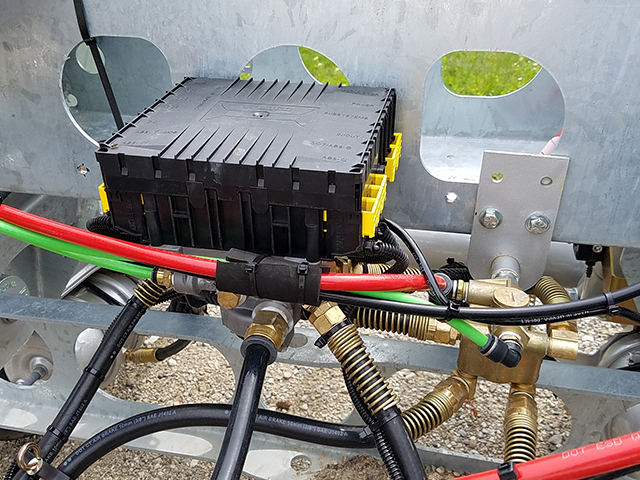 Direct drive by a heavy duty, spring mounted high torque hydraulic motor incorporates automatic surge overload protection that controls the speed of the discharge augers. 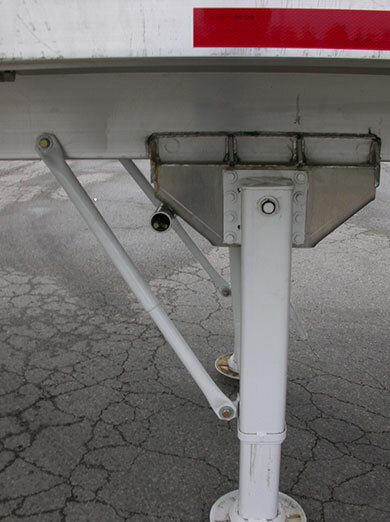 The design includes a heavy duty thrust bearing on the drive end and hanger bearing at the discharge end. 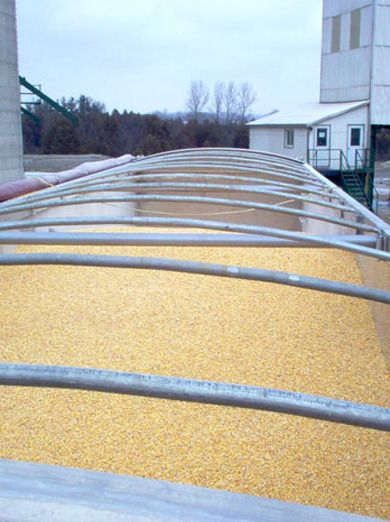 A plastic (UHMW) liner in the auger trough is supplied to provide a tighter fit between auger and trough as well as prolonged life of trough. 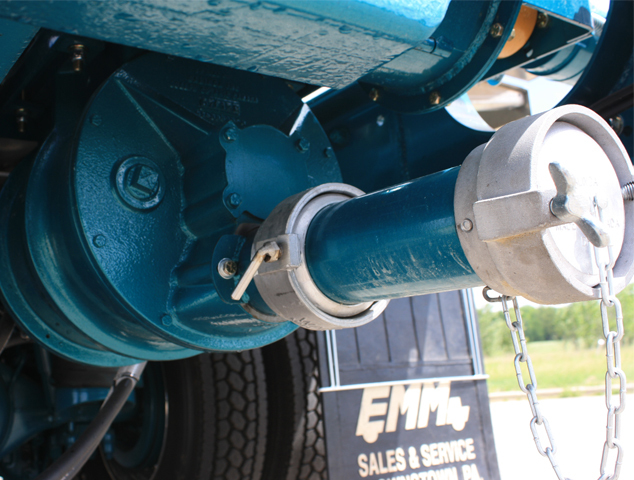 The Walinga Blower is a precision machined, Positive Displacement design blower. 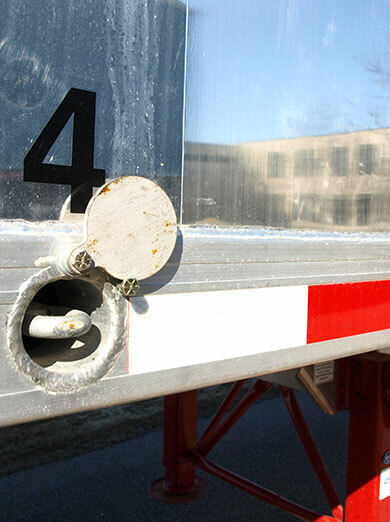 Hard chrome internal surfaces provide for greater wear resistance in transfer applications. 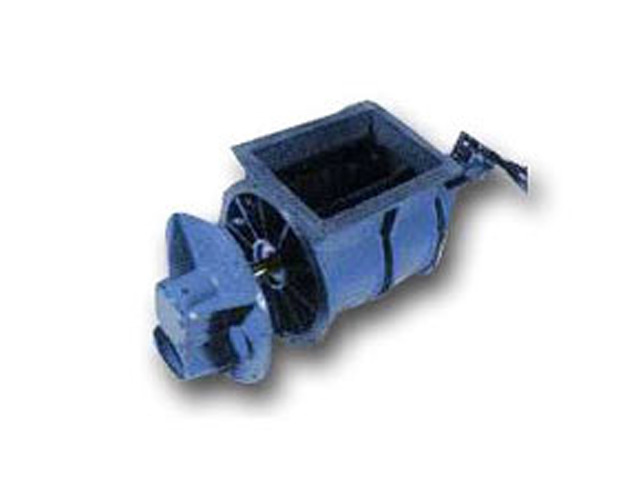 The Walinga blower is available in two prime sizes: Model 510-1100 cfm capacity and; Model 614-1800 cfm capacity. 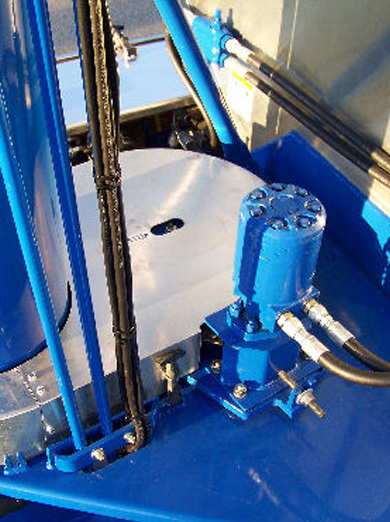 The Walinga Airlock is a precision-machined cast iron housing hydraulically driven airlock. 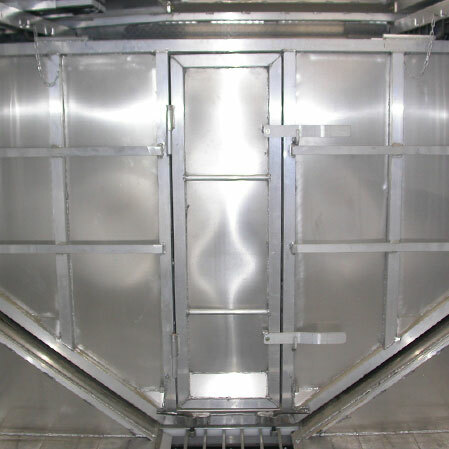 The Walinga manufactured airlocks have been designed to provide maximum performance, with minimal product damage. 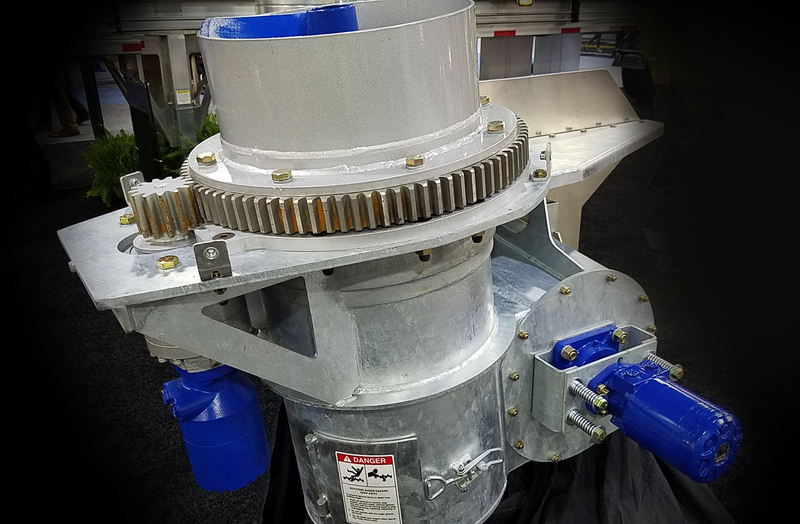 The fabricated steel rotor is available in 8 or 10 vane configurations with stainless steel, carbon steel knife edge or composite rubber adjustable tips. 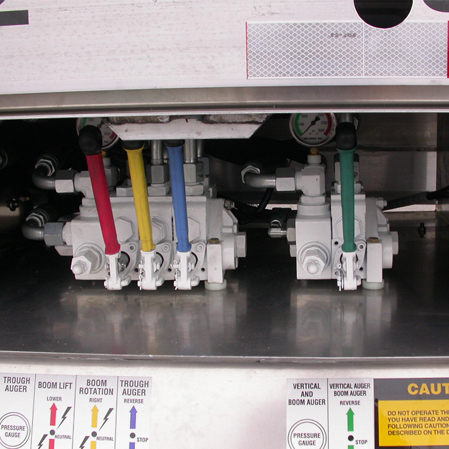 The injets and outlet are designed to allow for a freer flow of material providing for maximum capacity and minimal product damage. 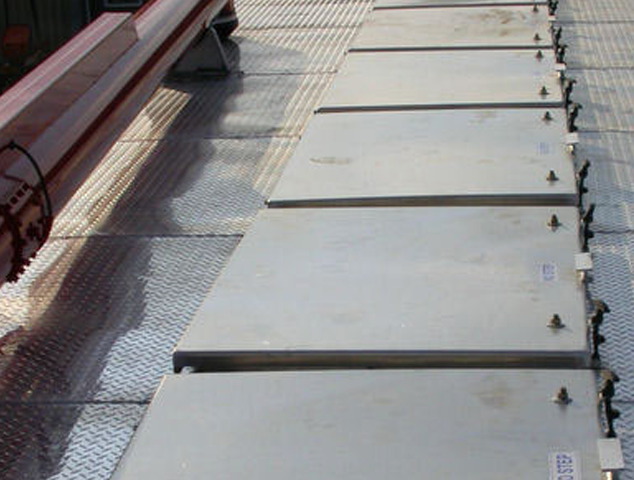 The rotation of the Boom is by means of RC80 primary reduction and RD50 secondary reduction drives. 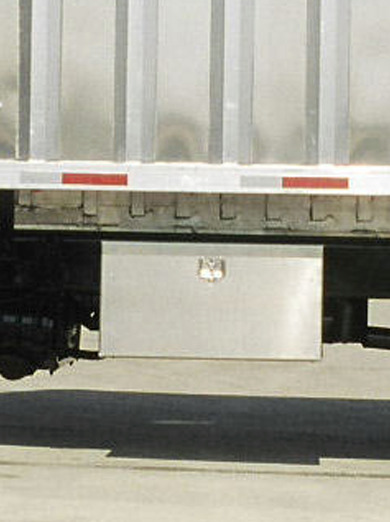 Rated strength is 14,000 lbs. (6343 kg). 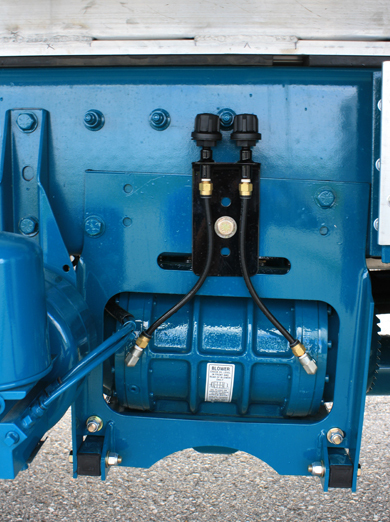 Hydraulic over load protection is provided through a cross over relief valve. 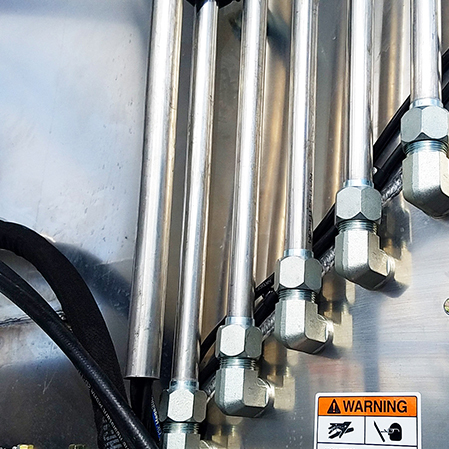 The WALINGA Bag/Bulk feed discharge system allows the operator to handle many extra tasks that will improve your performance and customer service. 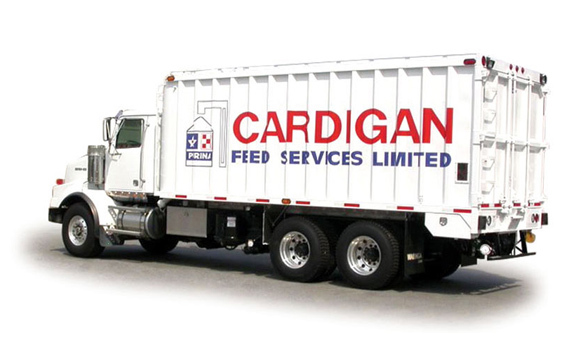 Load partitions are easily moved to allow maximum capacity as well as flexibility that will allow you to carry varying loads. 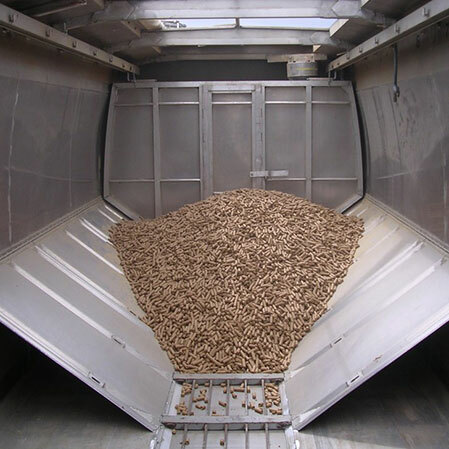 The feed is loaded into the different compartments from an overhead load out. 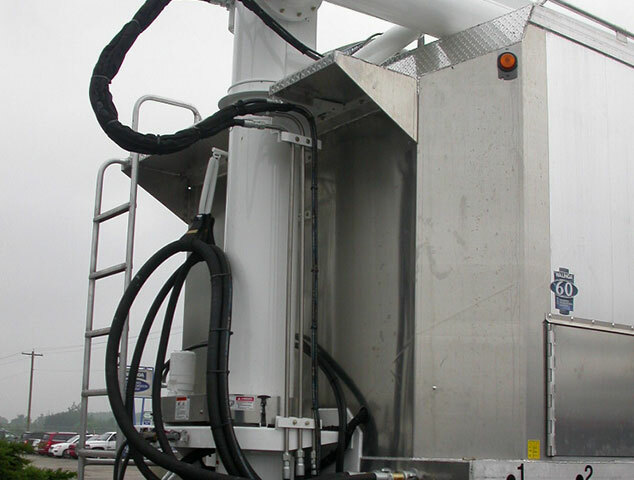 The body is raised by means of a front mount hoist allowing the product to flow to the rear of the unit. 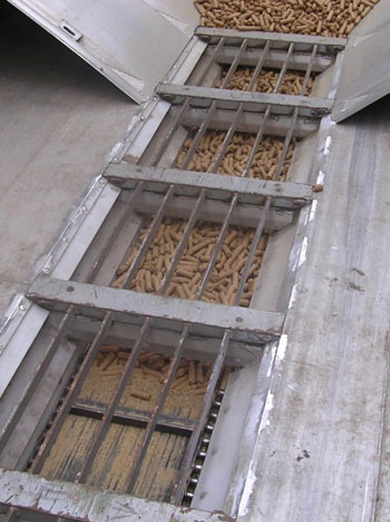 The feed drops into the precision machined airlock which meters the flow of the feed into the air line. 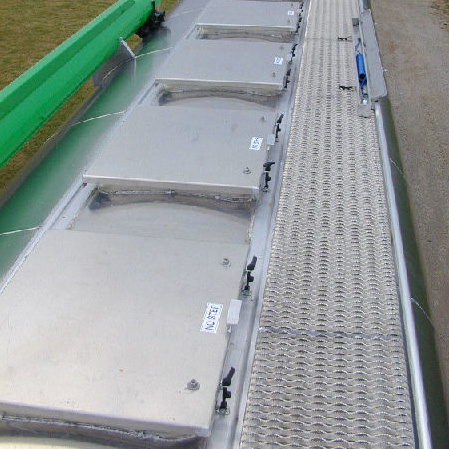 The feed is then blown on a "cushion of air" into the farmers feed bin. 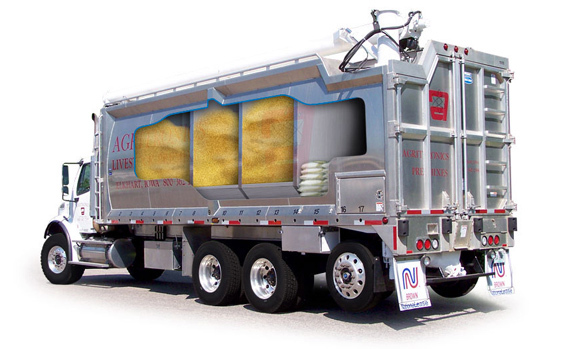 The WALINGA Discharge system or Blower unit, incorporates many exclusive features. 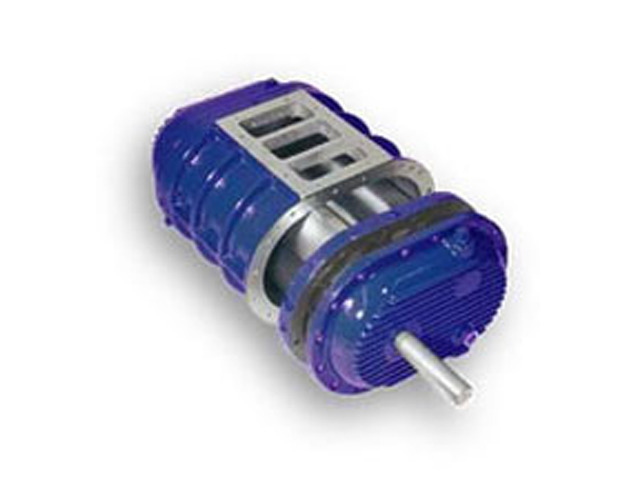 High Torque Power Take Off (PTO) 1400 series PTO Shafts, H.D. 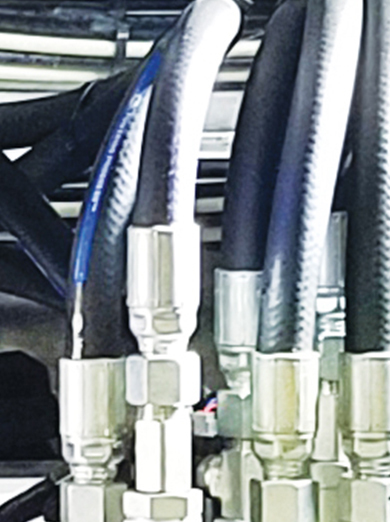 High volume hydraulic motors, JIC type fittings as well as "Hydraulic Tubing" are just a few of the standard components designed to withstand conditions similar to the harsh North American climate. 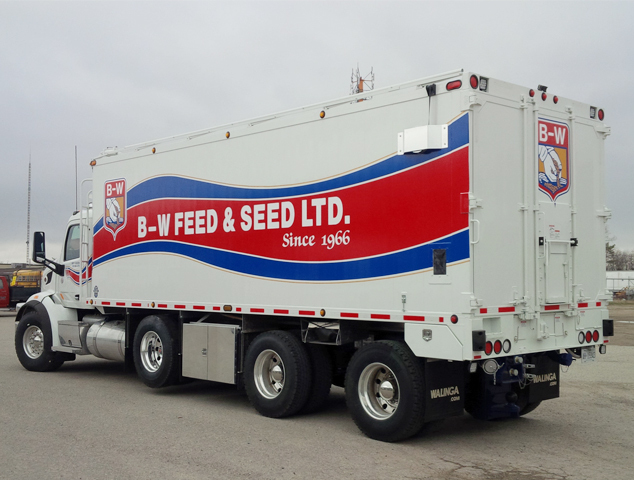 The Walinga Bulk feed units are designed to provide the operator with many years of trouble free service. 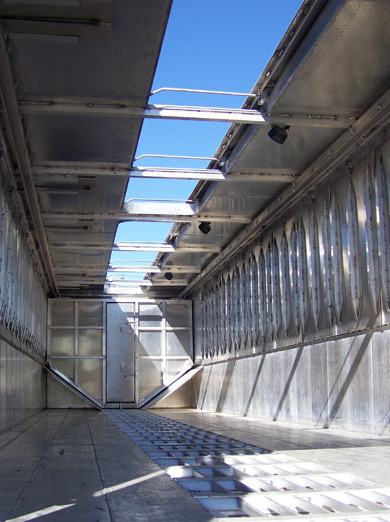 Variable roof options, moveable dividers, Transfer/Suction Units, stainless steel delivery hoses, all provide for greater flexibility to deliver to the customer what he wants and deliver it where he wants. 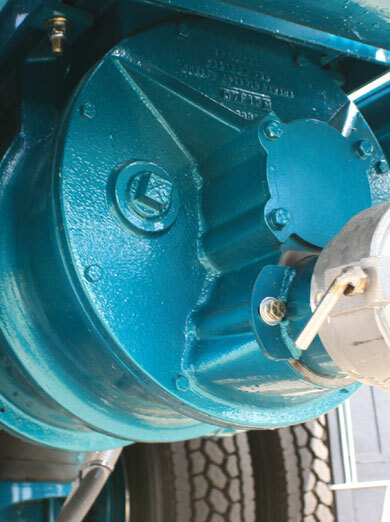 The model 510 Blower is manufactured by WALINGA to exacting specifications and quality control standards. 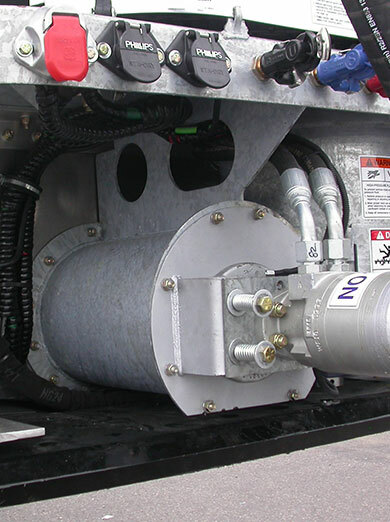 This high performance blower offers 1100 CFM (31.2m 2) at pressures up to 12 psi (82Kpa) continuously. Gears and bearings are splash lubricated. 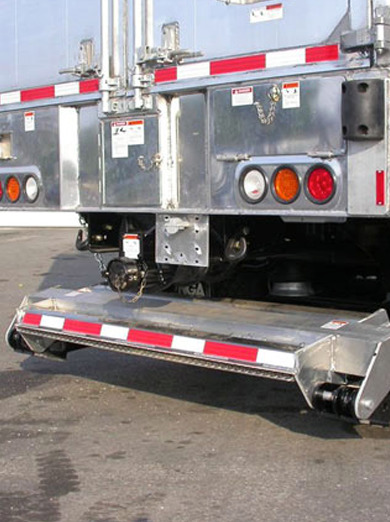 For transfer applications (Suction) the 510 Super Hard Chromed Blower is supplied as standard. 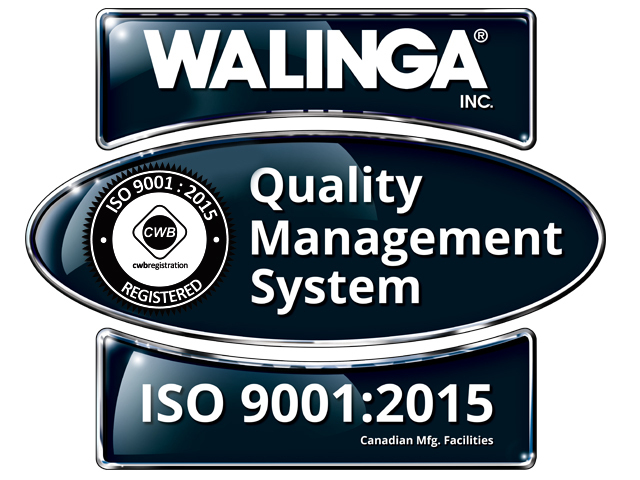 The WALINGA Airlock is manufactured exclusively for WALINGA in house with our high standards of quality control to ensure first class performance. Body is high grade cast iron machined to close tolerances. The 10 blade rotor has adjustable wear tips of either stainless or knife-edge carbon steel. 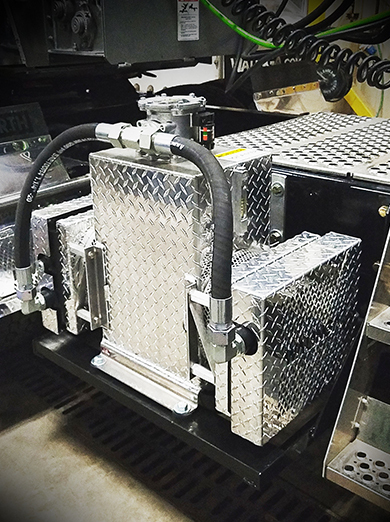 The Airlock is performance-matched to the Walinga 510 Blower and incorporates a unique design providing drop thru/flow thru product flow with 4 in. (100mm) or 5 in. 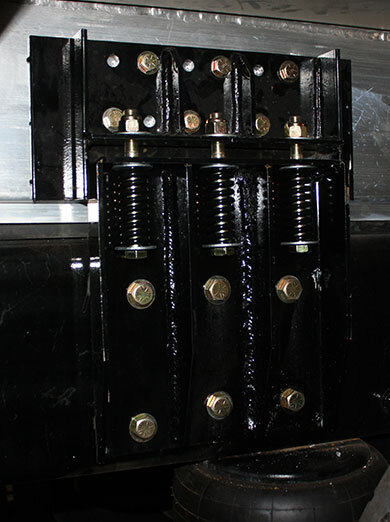 (125mm) contoured discharge ports to ensure maximum performance and minimum breakage.